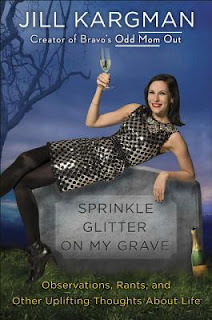 Jill Kargman cracks me up. Just uncontrollable laugh out loud! Sometimes laughing at myself, or quietly while staring at those around me. She says all the things people think and rarely say to others. With humor, sharp wit and unbelievable observance skills, Jill shares her views about her life, family, her childhood and the silly things people do every day while trying to play the part they have deemed for themselves in this show we call life. This book is styled in very short chapters that are easy, quick and enjoyable reads. Perfect for traveling or hanging out on a relaxing Sunday. If you are a fan of Odd Mom Out you will absolutely hear Jill’s voice telling you these stories and anecdotes as if she were your friend whispering on the phone while the kids are asleep. For me Sprinkle Glitter On My Grave has that Seinfeld flair, you either get it or you don’t. Jill Kargman is the ultimate girl next door and I am pretty sure if that was the case we would have been great friends. Highly recommend this fabulous entertaining read!